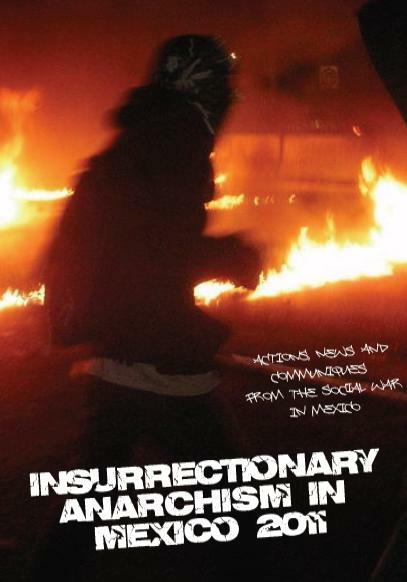 Over the last few years, Anarchist direct action has been expanding throughout Mexico, both in quantity and in force. 2011 was in no way an exception, with every-day conflict with the State more and more evident. We make special note of “Black September” in which the social war waged by Anarchist Action groups was at its strongest. We hope that 2012 can be even stronger, not only in Mexico, but in every corner of the Globe. Through these communiques we can learn that we don’t need to be a “professional” to carry out attacks such as these, but that anyone is capable of attacking the State and its symbols of power. Many of the communiques included in this publication were translated by comrades from various websites, including thisisourjob.noblogs.org, waronsociety.noblogs.org, 325.nostate.net and Actforfree.nostate.net. The compas from these sites do a very important job in communicating the actions for comrades around the globe, expanding the war to all parts of the world and promoting International Solidarity. We thank them for their valuable work. We also dedicate this publication to our brother Braulio Duran Gonzalez, currently kidnapped by the State of Mexico for anarchist actions, and to Gabriel Pombo da Silva, prisoner of war in Aachen, Germany. To expand the Social War on all fronts! ¡Viva la Anarquia! ¡Muerte al estado!